THE SKETCHNOTE HANDBOOK will be 30 days old on Sunday. It's hard to believe almost a month has passed since the book was released. In that month, the book has been well received and is getting some great Amazon reviews. The paper version of the book is impactful. I've heard report after report from buyers and reviewers that the combination of heavy cover stock, fingerprint-resistant coating, rounded corners, cream-colored matte paper with orange and black inks make a great impression. Peachpit editors Nikki, Katerina and I had the feeling these elements would work well together, but we never really knew until they were brought to life in the actual book. Lots of credit for the details goes to the Peachpit team — I am very thankful for their guidance on the printed book. LESSON: don't forget the physical experience of a project. How a thing feels and looks can have a huge impact on the person interacting with it. This suggests I should strongly recommend the physical book over the digital versions, because the physical object is so integrated with the book's message. 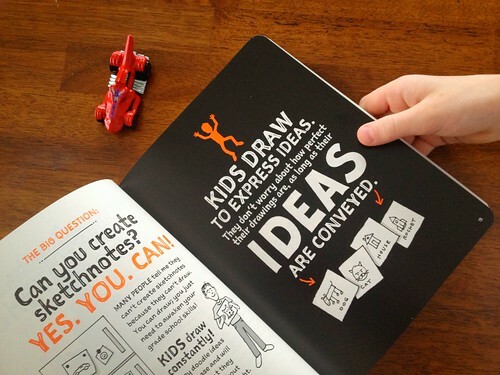 Having a great looking book which also shared a clear, encouraging message about sketchnoting was another key goal. The effort put into making sure that sketchnoting was approachable by non-artists is paying off. 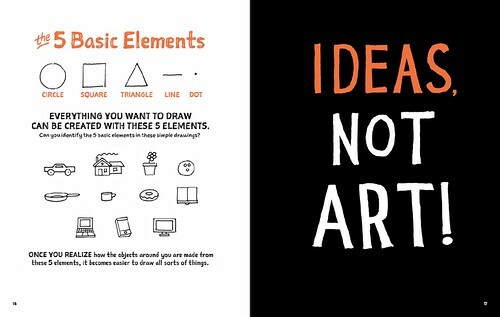 I've heard stories of readers who didn't feel artistic, giving sketchnoting a shot because of the approach and examples made drawing approachable and easy. I intentionally repeated the encouraging message of "you can do this" throughout the book and video (which drove my editors nutty). But I felt that unless this message was repeated over and over at different points through the book, it wouldn't be strong enough to encourage non-artists. LESSON: work hard to communicate your message clearly. It may feel repetitive, but constant reassurance might be just what someone experiencing the work needs. This also clarifies the core group to focus the book toward are regular, non-artists who want a way to become more visual. In the last month, I've discovered groups I wasn't anticipating would dig the book so much. The first group — kids. At the launch party several kids were excited to be at the event to learn sketchnoting techniques and my own 10 year old son immediately grabbed an early copy and claimed it for his own. I've had personal experiences showing the book to a variety of kids and in every case they immediately gravitated to the book and wanted a copy of their own. In fact, Nathan brought his own copy of the book to school and several of his friends and teachers wanted a copy! Teachers also seem very interested in sketchnoting, because they see their students having a new way to engage in the topics they're learning. I've heard positive feedback from grade school through college educators and am excited about opportunities to positively impact both students and teachers. Finally, I saw how much physician Bryan Vartabedian loved the book in a review on his blog. His perspective was that of a pediatrician explaining concepts to young patients and parents. His review has generated quite the discussion in the comments of the article. LESSON: be open to readers of all kinds and embrace those you aren't expecting might love and resonate with your work. Knowing how much kids, students, teachers and physicians are embracing the book's ideas encourages me to reach out to those groups more intentionally. Amazon reviews are a huge benefit to my book. They determine how buyers see and consider the book and can influence how books appear on Amazon bestseller lists. 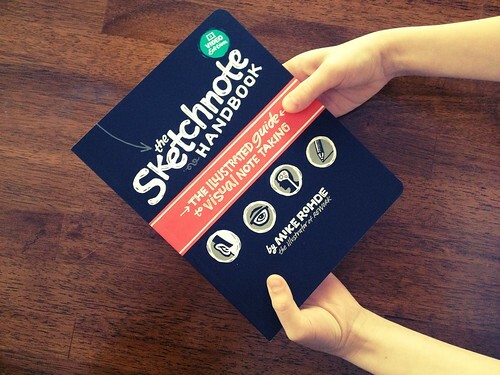 If you've bought The Sketchnote Handbook, please take 5 minutes to post an Amazon review. As of this writing there are 30 5-star reviews. I would love to add yours. Remember: you do not have to buy the book at Amazon to leave a review. I'm lining up several events to present at, including Portland Oregon in mid-February, San Antonio and Austin Texas (SXSW) in mid-March, Judson College in Chicago in early April and a few more (including Minneapolis/St. Paul) in the pipeline. More details here as they are finalized. Still in the early stages, I'm seriously considering a Sketchnote Workshop in Chicago, for 100-150 people in May or June of 2013. I'm working on a venue, speaker and presenters and a curriculum that builds on the book, since I think attendees will have already bought and read the book. If I decide to do a workshop, I'll write about it here on my blog and on Twitter as well, so stay tuned. If you are interested in an advanced techniques sketchnote workshop in Chicago this summer — let me know! We've already released the first of 10 podcasts at Peachpit.tv and have 8 of the 10 already shot and in production. We plan on releasing those every 2 weeks, starting in January 2013. You can subscribe to these video podcasts so you're alerted when new ones appear. We're also publishing these to YouTube. In 2013 I plan to finalize and add items to the font family I created with the help of my friend Delve Withrington of Delve Fonts. We're aiming to release a family of body and headline typefaces in the spring of the year — I want to perfect the characters and add some fun dingbats. More here when those are released. A big thank you to all who have bought and mentioned the book. It's your hard work that's helping The Sketchnote Handbook reach those who may not hear of it another way. Keep sharing the book and if you haven't left an Amazon review yet, please add yours to the list!